This trip digs into the cultural heritage of Bulgaria, from the era of the Thracians, who venerated Dionysus and produced the best wines in the antic World to the present day. Taste the fruit of thousands of years of winemaking know-how. Discover the history of the wine and cultural traditions of the Thracians, Old Greeks, Romans and Bulgarians, the monuments of the Antiquity and the Bulgarian Middle Age. Visit the Rila Monastery (UNESCO monument). Transfer from to the hotel. A guided walk tour of the city center in English to get acquainted with its long and turbulent history (about 3 hours). You will see St.Sophia church dating back to 5th-6th century of our era, a monument of Bulgarian medieval civilization that gave the current name of the town. Visit the largest cathedral Alexander Nevski with its gilded dome, the rotunda St.George 3th-4th century and the city fortress and you will feel the atmosphere of the city, which history dates over 5000 years ago. The Archeological museum in the building of the Büyük Camii. The Buyuk Mosque or Koca Mahmut Pasa Camii (period of construction 1451 – 1494 ) is the biggest Islamic building in Sofia, transformed into a depository for archaeological finds and antiques from Bulgarian lands. The premises and collections, enriched over the 110 year history of the Archaeological. Museum, currently attract many visitors to the city centre. The museum was opened to visitors with its first exhibition on 18 May 1905. The Banya Bashi Mosque ( Banya Basi Camii) was built over natural thermal spas and named after the neighboring Central Baths. The mosque was completed in 1576 and is therefore one of the oldest in Europe, as well as the last functioning mosque in Sofia. Departure Breakfast. Departure to Ognianovo. Visit of the vine yard and the wine cellar Bessa Valley. The name of the winery "Bessa Valley" means Valley of the Bessi (Thracian tribe that inhabited this land). The varieties of the vines are – Merlot, Cabernet Sauvignon, Syrah and Petit Verdot. Tasting of the wines of Bessa Valley. Departure to Villa Vinifera Wine Cellar. Wine-cellar Villa Vinifera has its own vines in the Rhodope collar - Brestovitza and Novi Izvor villages. The fruit is picked by hand in wooden baskets, to avoid any injury, which is observed in its squashing before fermentation. The quality of grapes and respectively the wine has been worshiped. Wine tasting led by a professional technologist, characteristics and knowledge of different grape varieties with an emphasis on Bulgarian sorts, their characteristics and indicators, a full description of the flavor and aromatic data. Optional: Individual bottling of wine from the guest and possibility to select and purchase your preferred wine, individually bottling of the wine and shaping the bottle, receiving a certificate of quality. Departure to Plovdiv - the second largest city in Bulgaria. It is one of the oldest cities in Europe. It was founded before Athens, Rome and Constantinople in the time at which was based and the ancient city of Troy. There are artifacts of Thracian civilization. The period during which Plovdiv has been within the Roman Empire was marked by the construction of many large public buildings like an amphitheater (late first and early second century of our era). And nowadays it is used for performances and outdoor concerts. Other major monuments of Roman civilization are the Roman Forum (2nd century BC) and Roman stadium in length of 180 meters and with 30,000 seats (second century of our era). At that time the name of the city was Trimontium, which means "town on three hills." The Ottoman army who invaded in 1364 and gradually conquered Bulgaria, gave new direction of development for the city. The Byzantine architecture was replaced by new buildings with typical oriental features. The new name of the city was Filibe. From this period is Cuma Camii The mosque is located in the centre of Plovdiv and was built in the place of Sveta Petka Tarnovska Cathedral Church soon after the town was conquered by the Ottoman army (1363 – 1364). During the reign of Sultan Murad II (1421 – 1451) the old building was demolished and replaced by the modern-day mosque. It was called Ulu Dzhumaya Mosque.It is one of the oldest Ottoman religious buildings on the Balkans. It is also one of the biggest: it is an imposing rectangular building with a 33 m-by-27 m prayer hall. It reveals influences from Byzantine and old Bulgarian architectural techniques: two layers of brick laid on top of each layer of cut stone. Bulgarian history is presented in the old town of Plovdiv with the big beautiful houses of 18 - 19 centuries. They are evidence of the economic power of the city during this era. At that time Plovdiv compete with Thessaloniki and Istanbul. The walk along the narrow cobbled streets between high walls and overhanging second floors take us back in time. In many of these houses are now occupied exhibition halls, shops and restaurants.Visit of one of these house and visit of the antic theater of Philipopolis (Plovdiv) with local English speaking guide. Walking tour of the city. Breakfast. Departure to the town of Ivajlovgrad, close to the border with Greece and Turkey. 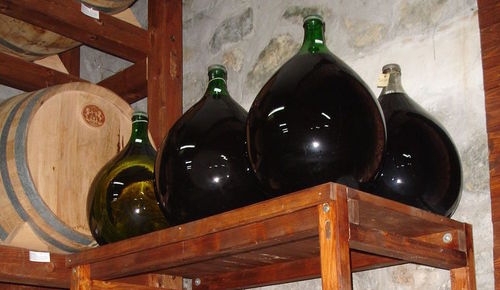 Visit of Zagrei wine cellar. Wine tasting. Departure to Ivajlovgrad. Visit of Villa Armira – one of the most precious ancient monuments. Armira Villa is one of the most interesting monuments from the time of the Roman Empire. The villa was luxurious, with remarkable design, magnificent marble decorations and original floor mosaics. It was built in the second half of the 1st century AD by a renowned Thracian aristocrat. Wine tasting at Yamantiev . Dinner. Overnight. The eastern hill is the old quarter of town. Small, steep streets lead to an old fortress on the hill which is worth to visit. Besides the castle, in the neighborhood, preserved old houses can be seen with small alleys and flower gardens. Here is the house-museum of Mehmet (Mohammed) Ali Pasha, who built the largest imaret in Europe in honor of his home town Kavala. Another famous landmark and symbol of the town is the Kamares Aqueduct, built around 1550 by Suleiman the Magnificent, consisting of 60 arches of various size the largest is 52 meters tall. Visit of local wine cellar. Departure to Asprovalta resort. Dinner. Overnight. Breakfast. Departure to Thessaloniki. Walking city tour. Thessaloniki is the second largest city in Greece. It was founded by King Kassander of Macedon in 315 BC and was named after his wife Thessalonike, who was a half-sister of Alexander the Great. After the fall of the Macedonian Kingdom in 168 BC, the city came under Roman rule. Architecture in Thessaloniki peaked while the city was part of the Byzantine Empire. The church of Agia Sophia is a brilliant Byzantine structure of detailed mosaics and elaborate gild works. The White Tower, a 16th century edifice, is considered to be the symbol of the city. A major part of the ornate Arch and Tomb of Galerius still stands today. Known as the Kamara, this reddish-stone structure has withstood the damages inflicted upon it through centuries. Visit of wine cellars and wine tasting. Departure to Petrich. Dinner. Overnight. Breakfast. Departure to Melnik. Walking tour. The smallest town in Bulgaria (208 residents), Melnik, is nested in the south slopes of Pirin, among sand pyramids with queer forms. Melnik is declared a natural and architectural reservation. The town is famous with its beautiful houses from 17-e and 18-e centuries and its red wines. Visit of Villa Melnik wine cellar. Wine tasting. Departure to Rila monastery. Rila Monastery is one of the most impressive UNESCO world heritage sites in Bulgaria and it is the largest Eastern orthodox monastery in Bulgaria. Founded in the 10th century, the Rila Monastery is regarded as one of Bulgaria's most important cultural, historical and architectural monuments and is a key tourist attraction for both Bulgaria and Southern Europe. The whole complex occupies an area of 8,800 m² and is rectangular in form, centered around the inner yard, where the tower and the main church are situated. Return to Sofia. Visit the Boyana Church, located on the outskirts of Sofia. It is a true masterpiece of the Bulgarian Middle Ages and the avant-garde of the European Renaissance. Its frescoes dates from 1259 year and it was declared by UNESCO a World Cultural Heritage. Visit of the wine cellar Medi Valley and wine tasting. Medi – this is the name of the antic Thracian population of this region. Spartacus, the slave who has organized the biggest riot in the Roman Empire comes from the Medi. Tasting of white wines (Chardonnay) and red wines (Merlot, Syrah). Arrival in Sofia. Dinner. Overnight.